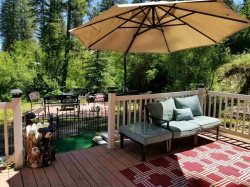 Located just outside the Boise National Forest boundary, the fabulous mountain chalet has it all!!! Totally private three levels of gorgeous living and river views. Enter on the main level to the main living area with a wall of windows to let in that beautiful mountain sunshine! Fireplace, big screen TV with Dish and plenty of seating make it easy to relax in your home away from home. Rounding out the main level are two private bedrooms, both with Queen beds, a large full bath, a fabulous fully stocked kitchen and dining area. The fantastic wrap around deck is accessed from the main level - BBQ area just outside the kitchen door makes meal prep a breeze. Plenty of seating on the deck for socializing and enjoying the river views. Head down to the lower level and you will find another private bedroom with a Queen and set of bunks. A second living area is made cozy with a wood burning stove, along with a TV for movies and, of course, the full-size pool table and a foosball game as well! Head to the upper level where a cozy living area with historical pieces is the perfect place for good conversation away from the kids! Also in the loft is a desk for those that must work and a comfortable sleeper sofa. Off the loft is the fabulous master bedroom with a Queen bed, plenty of room and a fantastic old fashioned soaking tub for your pleasure. Head out the door and you won't be disappointed! Access the footbridge to the hot tub with changing room overlooking the river for a super experience! Just out the front door is a basketball hoop, a fantastic outdoor fire pit area , the horseshoe pits and the forest trail down to the river! You can put in up in the forest and float right back to the cabin or just sink some chairs in the sandy area along the river's edge. For your convenience there is WIFI and central air conditioning. Located just off the main road, this is your fantastic base from which to access all the local amenities and fantastic outdoor adventures! Karen, Valerie and all - FANTASTIC! Staff is always friendly and helpful. Thanks for Everything! Karen was great to work with. Always responded promptly. I was emailing back and forth with Karen multiple times and she was extremely timely with her responses, was very easy-going, and awesome to work with! We will definitely be using Idaho Vacation Cabins again in the future! The Middlefork Cabin was perfect for my extended family reunion. The kitchen and big screen tv made us feel right at home, but we spent the majority of our time outside on the beautiful covered deck. Our only regret was not bringing tubes to float the river and fishing poles. We can't wait to stay here again! Very kind and caring people. Everyone seemed eager to help and make sure that we had what we needed. We spent some time doing a photo shoot of our extended family group. The setting is so beautiful and the pictures look great. We have some good photographers that found just the right angles and lighting. We will make photo books and save the memories forever. Very helpful!! Karen worked with me and made the whole experience awesome. Great experience. Karen did a great job!